So, here is the headboard that Curt and I made. I am still not sure if I like the bump in the middle, but Curt does and so for now it stays. I am very pleased as to how it turned out. It was our first attempt and I think we did well. Now all I need is bedding that I like to go with it. I actually like the bedding that I have but I think I want to try something else. Curt thinks Im crazy because we have not had our current bedding very long. Im sure that he is right. Our room looks a bit bleak from this angle, but its actually quite cute, espescially when the bed is made. 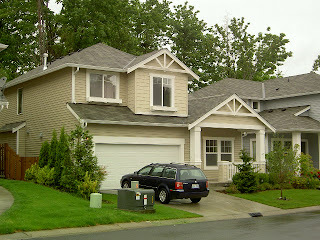 Well, the time as come to sell our adorable home in Maple Valley. Our very first home that we ever owned, sniff, sniff. We just dont know how long we are going to be here and therefore need to let our home go to someone else who can love it a lot. We bought it 6 months after we got married and have so many great memories in it. I think every Sunday Jenn and Bill came over for veg day after church. We always seemed to make tacos or Papa Murphys pizza. Then we would make the boys go down to Safeway and buy brownies and icecream. Safeway was just down the hill and what a wonderful shopping area to have within walking distance. We always got to see Mt. Rainier as we drove out of our neighbor hood on a clear day. Curt and I walked a lot in the neighbor hood because it was such a great walk and a peaceful place. It was also a great place to run. When Jana and Justin and the kids lived with us we would take the kids to the awesome park we had. Jana and I would walk to Starbucks every Saturday morning to get our fix and some exercise. I feel teary as I type. We are really going to miss our house and the most awesome neighborhood in the world! Look at this adorable table that I found! I had been looking and looking for a table to fit that wall because I felt like the wall needed to be anchored. I was browsing Ross one night and bam! there it was. Its hand painted and had a broken leg so I got 40% off. The broken leg was nothing, very fixable, so I got a great table for a lot less :) And I am happy!